During Advent, we often hear the word peace: “Peace on earth, good will toward men.” “Sleep in heavenly peace.” “His law is love and His gospel is peace.” Isaiah 9:6 says, “For a child is born to us, a son given to us. And the government will rest on his shoulders. These will be his royal titles: Wonderful Counselor, Mighty God, Everlasting Father, Prince of Peace.” Just by being born, Jesus brought peace to our broken planet. Hallelujah! Someone asked me yesterday if I thought “peace on earth, and good will toward men” (on a global scale) was really possible for us to achieve. I pondered it for awhile and concluded that, no, it isn’t. Man is fallen. We are sinful beings. We can strive for it, but it won’t be here with any form of longevity until Jesus returns. We discussed how nations are at war, and nations are made up of broken communities formed by sinful people. Relationships are constantly being torn apart. The brokenness we have with others is what prevents peace from existing. So I turned inward. I started examining my relationships and how Christmas is as good a time as any to get going on some reconciliation. I know I can’t tackle the entire mountain of brokenness in my life at once, but I can start on one piece. God has been speaking to my heart this past week that the time has come to approach a friend with whom I have not been spending time. We had a disagreement in the spring, and our friendship has suffered as a result. Though we were both in the wrong, I have been closed off in my heart towards her, and the Holy Spirit was nudging me to stop. I prayed in faith that God would help me approach my friend when the time was right. For me, making an effort to connect one-on-one again would be an act of faith that God could restore what was broken. On Sunday morning, I acted vulnerably and asked my friend if she would be interested in hanging out with me. (I know this sounds very basic to a friendship, but we haven’t done this for 8 months!) She responded very happily and readily. I don’t know if the Spirit will lead me to share what prompted my actions (I’m fine either way), but I am glad that this Advent, I will be celebrating Christ’s birth with a very personal thankfulness for His supreme example of reconciliation. I hope that you, too, will experience Advent in a personal, redemptive way this year. Have a wonderful week. What great hope this verse gives us! Have you ever felt like your days just blended together and nothing stood out as being awesome or even remarkable? I was discussing this idea with my Sunday school friends yesterday and I heard myself saying, “Time seems to go by fast when we let life live us rather than us living purposeful lives.” (Wow, that’s deep for me!) I am a wife, mom, friend, daughter, and many other roles – but my biggest role is often forgotten: I’m a child of God. Paul tells us in these verses that we are designed with a purpose – and for a glorious life! How do you live your life on purpose? In what ways has God surprised you? What are your goals for this holiday season? We spent some time in the above passage in my Sunday school class yesterday, kicking of a 3-week series on the purpose of Christmas. I asked each person to spend some time reflecting on the amazing words above, and to share a phrase that stuck with them personally. The responses were varied and beautiful, and I also shared my own: the repeated use of the word “separate”. I thought about how that word describes our relationship with God before Jesus enters into it. Our sin separates us from a perfect, holy God, and only Jesus can bridge that gap. In taking our sin upon Himself and nailing it to the Cross, Jesus made a way for us to be in relationship with God forever. Hallelujah for Christmas, the birth of our Savior! So seeing the word “separate” in the passage from Romans has all new meaning, because of the words that precede it: “nothing can”! We are stuck to God like glue. In the words of a guy in my Sunday school class, God is like this loving, ever-present bodyguard. That is certainly a nice picture to have in mind when facing the trials of another day – and a great reason to begin celebrating Advent. It is this same Jesus that we celebrate at Christmas. May your Advent season be shaped and colored by the thought that He is your friend, and His love never fails. Have a great week, Mom Crowd! 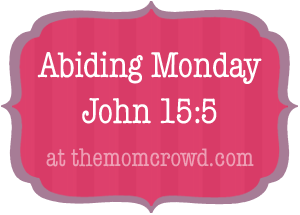 Abiding Monday: Are You in a Funk? Not long ago, I was in a hefty spiritual funk. I hadn’t spent any personal time with God in probably a month or more. My life was “fine” on the surface, but I found myself growing increasingly annoyed about everything and everyone. My husband and children were receiving the brunt of it, which was so unfair to them. And my husband confessed that he was also feeling spiritually down & out. Basically, we were a family running on empty. This has happened to me before, and I know it will happen again. Maybe you’ve been there, too. Just in a funk. I knew I had to snap out of it. And there’s really only one way to do that: make the choice to snap out of it. For me, spending time with Jesus on a consistent basis is the cure. Once a week isn’t gonna cut it. Not even two or three times (though that is certainly better than nothing). I know I am at my best – my most patient, my most humble, my most pleasant, and the most joyful – when I keep my nose in scripture and my prayers consistent. Jesus, I pray for any mom out there this week who is trying to claw herself out of a spiritual funk. Please bless her with the gentle reminder that you are there, ready to breathe new life into her days. May we all choose to spend consistent time with you. Amen. is it the opposite of boredom? I generally love change. I like rearranging furniture, the transition from one season to the next (hallelujah for fall! ), and moving somewhere different after awhile. I also struggle with change. Whenever something new happens, something old fades away. Patterns that were once vital give way to new routines and responsibilities. It’s the cycle of life, really. I both like it and am totally overwhelmed by it. This simple yet powerful verse from Hebrews really keeps me grounded in times of great change. New jobs. New babies. New addresses. When everything around me is changing, and when relationships are put to the test, it is an incredible encouragement to reflect on the One who does not change: Jesus. He is utterly dependable, wholly reliable, and fantastically there. All the time. In my times of struggle and uncertainty, I find myself worshipping God with one song over all others: “Unchanging” by Chris Tomlin. All of the lyrics celebrate the consistency and wonder of God, and they build up to this simple bridge: “You were, You are, You will always be…” What a comfort! Lord, we are grateful for how you remain consistent in our lives – you are ever faithful, and you never fail! As we are tossed by the ebb and flow of our own doubts and uncertainties, our struggles and fears, please whisper your promises to us and help us see your goodness this week. Amen. Did you do the writing prompt? Share your list in the comments! What about God’s unchanging nature captures you? And as a bonus, here’s a video of Tomlin leading a church in worship to this song. May it encourage you this week as it has so often encouraged me.